Welcome to BP's new Donation Portal. 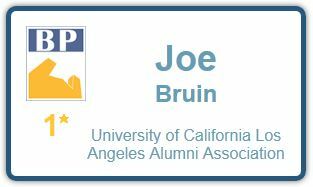 You will use this portal anytime that you want to make a contribution to the new BP Endowed Student Scholarship at UCLA or the new BP Alumni Career Program at UCLA. BP has started a UCLA Endowed Scholarship and all contributions will count towards Alumni Association Membership Level, Chancellor's Society Level and Lifetime University Giving. In addition, the first 200 people who commit to donate at least $500 payable one time or in installments over 5 years will become part of the BP 200 Club. They will receive a number between 1 and 200 based on when they make their commitment and these numbers will be proudly displayed on the new, large BP name tags. To learn more click here for Scholarship.